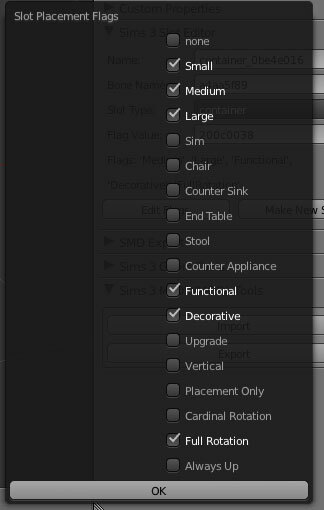 Mod The Sims - Blender 2.65 TS3 Slot Editor Updated 6-23-17?! Blender 2.65 TS3 Slot Editor Updated 6-23-17?! This script is for importing RSLT(slot) files into Blender 3D 2.65. The slots can be imported over a mesh, then moved to the desired position. Slots can also be added and deleted, and it works on routing, container, effect, and IKtarget slots. 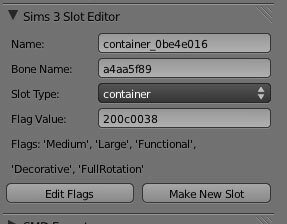 Additionally, slot flags(for container slots) can also be edited. 1. Download and extract the "io_TS3_rslt.py" and put it where you can find it. 2. 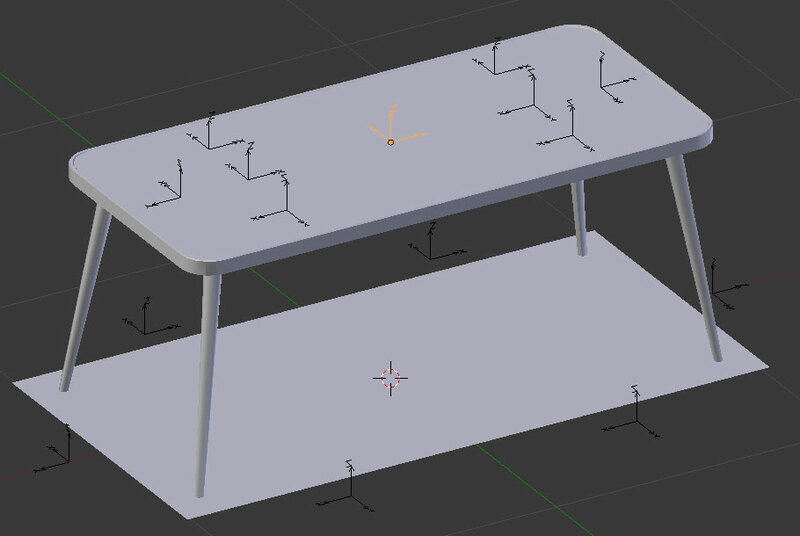 Start Blender and go to File->User Preferences(or press CTRL+ALT+U). 3. Click the "Add-Ons" button at the top of the User Preferences window. 4. Click the "Import/Export" button on the left, then click the "Install Add-On" button at the bottom. 5. Navigate to where you extracted the file and select the "io_TS3_rslt.py" and click "Install Add-On". Sims 3 RSLT Editor is added to the the list. 6. Click the check box on the right in the list. The importer is added to the File->Import menu, and the TS3 RSLT Editor panel is added to the Properties Editor under Scene. note: You may need to rename the the RSLT file to filename.slot. Renaming is really only necessary for files with long names, because Blender has a limit. Start Blender, load/make your mesh, and go to File->Import->Sims 3 RSLT. Navigate to the your folder and select the .slot file. Slots will be represented as axes. Right-click to select the slot and press 'G' or use the 3D transform widget(the red, blue, and green axis). Select the slot and press 'X'. Click the 'Make New Slot' button. In the dialog, add the name, bone name(FNV32hash w/o the '0x'), and select the type of slot you want to create, then press OK. If you know the value, enter it(without the '0x') in the 'Flag Value' box. If you don't know the value, just click the 'Edit Flags' button and check the flags you want in the dialog. -names for new slots are automatically hashed(thanx atavera). -added toggle buttons for x-ray visibility of slots. Thanks to Inge and Peter Jones for their help. 257 people have said thanks to cmomoney for this download.